Buckminster Fuller is often described as a visionary, and the opening of The Silent Spring Project reflects that idea in an intriguing and unexpected way. It begins in blackout. A spotlight comes up slowly to reveal a piano, but no player. We begin to hear piano music accented with bell-like percussion, disembodied from the instrument we see on stage. A woman’s voice enters. As more lights come up, we see the singer moving downstage, finally connecting what we see with what we hear. As she takes her place at the piano, we realize we were hearing one performer from two sources — live and recorded — all along. The effect is of a blurred image slowly coming into focus, and it fits perfectly with the sung text: a quote from Fuller describing how he was cross-eyed from birth due to extreme farsightedness. Even after his vision was corrected, he continued to relate to the world on the macro level, with a lifelong affinity for large patterns. This intimate beginning, revealing how Fuller’s early challenge became a transformative way to see the world, draws us in and prepares us to encounter Rachel Carson’s exhortation to protect our environment. The Silent Spring Project invites us to contemplate the impact of humans on the earth, for good and ill. 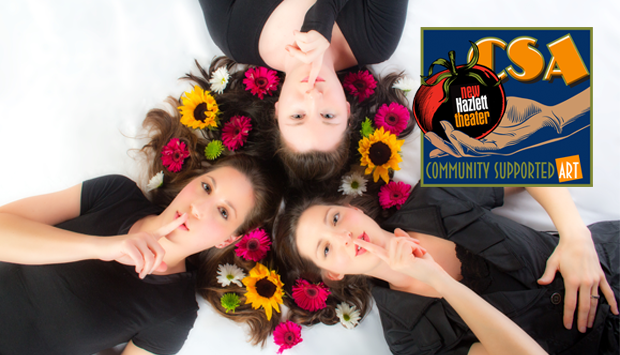 The Silent Spring Project is the fruit of extensive collaboration over several years. It began as a recording project, with music of composer Mark Fromm performed by the Trillium Ensemble (flutist Elise DePasquale, clarinetist Rachael Stutzman Cohen, and pianist/vocalist Katherine Palumbo) with guest percussionist Scott Christian. Once they completed the recording, the musicians planned to celebrate its release with a performance. But they wanted to do more than “just play all the songs you’re going to hear on the CD,” as flutist Elise DePasquale explains. They began to dream of how the music could be part of a larger production. To that end, the New Hazlett Theater’s CSA (Community Supported Art) Program brought the musicians together with a group of theatrical artists, including sound designer Don Maue, set designer Lisa Leibering, lighting designer Antonio Colaruotolo, and producer Jason Allison. Together, they created a dramatic experience that combines music, storytelling, and visual elements. The sung and spoken texts come from the writings of Buckminster Fuller, including the opening vignette described above, and from Rachel Carson’s groundbreaking book for which the project is named. The combination of these two writers arose naturally, since Fuller’s work was Fromm’s inspiration for the recording’s opening track, A Citizen of the Twenty-First Century Looks Back, and the last track is entitled Silent Spring in honor of Carson. Fromm used several methods of adapting his music for the live production, layering recorded music and live performance to create new sonic dimensions. At times, recorded excerpts function as the soundtrack for spoken and sung text. At other moments, one player speaks while the others play. Newly composed material is performed over the pre-existing recordings, and at one point the flute and clarinet use the original material as fuel for improvisation. At the end, the title track, Silent Spring, is heard live in its original form. Fromm’s music has a kaleidoscopic quality, shifting scale and perspective while also remaining rooted, with harmonies that are substantial and distinctive. The music weaves a frame for the words to rest on and move through. In that sense, it’s a sonic equivalent of Fuller’s geodesic dome design, and we see several small physical examples of it suspended above the stage. The musical and theatrical elements create a space for each other, where neither one overpowers or recedes into the background. The texts from Carson and Fuller urge us to engage with both the danger of human recklessness with the environment and the potential for progress through acting in harmony with it. Fuller viewed creativity as a process of deploying what already exists in the universe rather than adding to it. The artists involved in this project seem to have absorbed his message, combining diverse artistic elements into a new whole that feels thoroughly organic and seamless. The performers embody the natural world by placing considerable physical demands on themselves. In a departure from traditional procedure, Elise DePasquale and Rachael Stutzman Cohen stand throughout the production, and sometimes play while moving around on stage. Stutzman Cohen is able to play bass clarinet while standing thanks to a custom-made pedestal created by set designer Lisa Leibering. Elise DePasquale moves through a broader range of notes than flutists usually get to, thanks to a flute arsenal equipped with alto, bass, and contrabass flute in addition to the primary instrument. Flute and clarinet figures naturally evoke birdsong at times, creating a felicitous connection with Rachel Carson’s warnings. Both players have impressive cadenza-like moments where their virtuosity is on display. Katherine Palumbo’s dual ability as pianist and vocalist enriches the production, creating the powerfully arresting opening where she sings over a recording of her own piano-playing. Later on, we see her speaking and playing at the same time, adding an extra challenge to already difficult music. At the very end, Fromm’s Silent Spring weaves a choral texture with flute, clarinet, and Palumbo’s voice, and the trio moves close together downstage, completing the journey they initiated at the beginning.